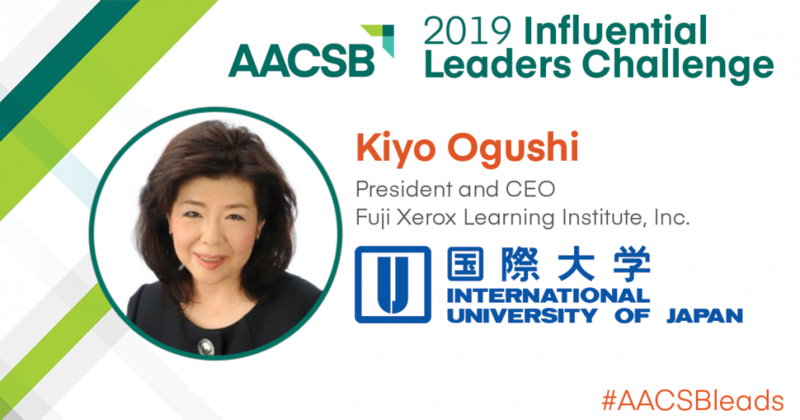 [Minami Uonuma, Niigata] (February 5, 2019)— The International University of Japan announces that Ms. Kiyo Ogushi (Class of 1992) is one of 33 business school graduates honored by AACSB International (AACSB)—the world’s largest business education alliance—as the 2019 Class of Influential Leaders. The annual challenge recognizes notable alumni from AACSB-accredited schools whose inspiring work serves as a model for the next generation of business leaders. Ms. Ogushi, nominated by IUJ’s Graduate School of International Management, currently serves as President and CEO of Fuji Xerox Learning Institute. She has 24 years of experience in leadership and organizational development, change management initiatives, and talent development. Ogushi’s educational and training consulting expertise has touched many Japanese corporate leaders, helping them to reach global standards of management and leadership skills. Similarly, she is a role model for the next generation of coaches and trainers, helping their careers to flourish. Also, as a president and CEO of a company in Japan, she is able to inspire other Japanese female staff to become leaders in their fields. Now its fourth year, the Influential Leaders challenge has recognized almost 200 business school graduates for creating lasting impact in business and society. All honorees are have earned an undergraduate, graduate, or doctoral degree from one of the more than 800 AACSB-accredited business schools worldwide. For more information on the Influential Leaders challenge, and to view a full list of honorees, visit www.aacsb.edu/influential-leaders. As Japan’s first English only graduate school, founded in 1982, IUJ has been leading the way toward internationalization. With the extensive support of Japan’s industrial, educational and local communities, IUJ trains professionals who can actively make contributions to the international society with a high level of interdisciplinary and specialized knowledge. The Graduate School of International Management (GSIM) at IUJ is dedicated to developing “wise” (i.e., socially responsible) individuals for global business and social leadership, with an emphasis on serving the emerging countries. The two key components of GSIM mission are nurturing Social Responsibility (SR) and Global Business (GB), which the school aims to achieve and operationalize through its innovative policies, recruitment strategies, placement efforts, teaching, research, and service strategies.